"Love the entire staff....I feel like family every time I come in." "Dr. J and his staff are the best! They are kind and helpful and do a great job taking care of my teeth! Thanks team!" Fort Walton Beach dentist, Dr. Nick Jazayeri, has been providing high quality Family & Cosmetic Dentistry to residents of Fort Walton Beach and surrounding communities for over 14 years. At Personal Care Family Dentistry we offer a full range of dental services including: Lumineers, Crowns & Bridges, Invisible Braces, Partials & Dentures, Root Canals, Tooth Colored fillings, Extractions, Teeth Whitening and Children's Dentistry. Doctor Jazayeri (Dr J) enjoys informing his patients of different treatment options for their specific situation. Often times, there are multiple ways to restore ones oral health. Dr. Jazayeri is very patient to explain the benefits of each treatment option so that you are able to make an educated decision for what is best for you. We are proud to serve the Greater Fort Walton Beach area including Crestview, Navarre, Niceville, Bluewater Bay and Destin. We are conveniently located on Highway 98 next to Liza Jackson Park just minutes from Eglin Air Force Base and Hurlburt Field. Patients travel from neighboring counties including Santa Rosa County, Walton County and of course Okaloosa County and much farther to be treated by Dr Jazayeri. To see a map of the location click on our Google Map link. We strive to accommodate our patients in every way. We file your insurance and collect only your co-payments if you have valid insurance. Although we are not preferred providers for all insurance companies, we do accept almost all Dental insurance available including United Concordia. In addition, we are a in network providers for Delta Dental Premier, Aetna Dental, Cigna and many MetLife plans. Interest free financing is also available Care Credit. Master Card, Visa and Discover are also accepted. For those who are anxious or fearful of their dental appointment, we offer Nitrous Oxide or a Pre-medicament, which allows you to relax and get through your procedure without stress. In addition, Dr Jazayeri is very attentive to his patient’s concerns and fears and will always strive to be sensitive to everyone’s individual needs. 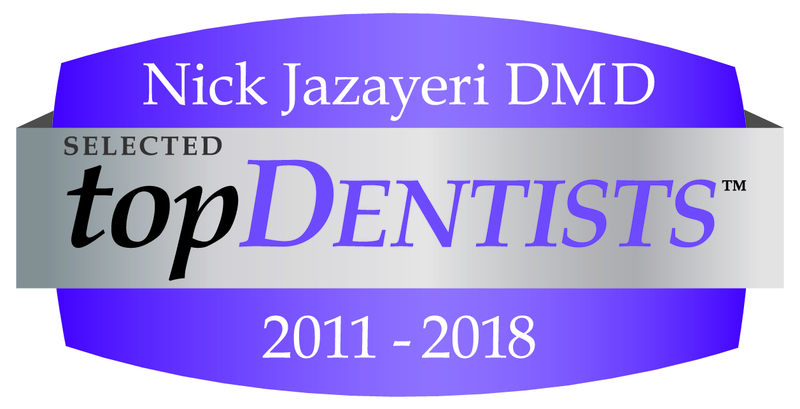 We are proud to announce that Dr. Nick Jazayeri has been voted by other dental professionals themselves as one of US topDentists for the past 7 years. He is the only General Dentist in the Fort Walton beach area to receive such a distinct honor. For more information feel free to visit usatopdentists.com. Dr. Nick Jazayeri is a professional dedicated to Excellence in General, Family, & Cosmetic Dentistry such as Dental Makeovers, Porcelain Veneers, Teeth Whitening, Crowns/Caps & many other dental procedures. Please come and visit Fort Walton Beach dentist, Dr. Nick Jazayeri.